Jennings Jewelery owner Joann Tate observes the damage done to the window of her store during an attempted break-in early Tuesday morning. A person or persons tried to break into a Woodbury jewelry store early Tuesday morning. It was one of multiple incidents of break-ins, attempted break-ins and vandalisms reported around Woodbury this morning. An attempted "smash and grab" occurred at Jennings Jewelers on Main Street, across the street from the Cannon County Courthouse, around 3 a.m.
A brick was used to try and break through the glass of one of the front display windows of the store. The brick was recovered as evidence. Nathan Jennings, who works in the Cannon County Circuit Court Clerk's Office and lives in the area, said he heard the store's alarm system go off at about 3 a.m.
Jennings said he first thought a power outage had caused the alarm to be set off. However, he looked out of his residence and saw the lights were still on around the courthouse. "I heard the alarm and thought that's not normal," Jennings said. "I did not hear a car at all." Woodbury Patrolman Brent Brock and Cannon County Sheriff's deputies Seth Perry and Brandon Gullett responded to the alarm. Jennings said they arrived within a few minutes of when the alarm was activated. "Their response time was amazing," Jennings noted, "no more than two minutes." 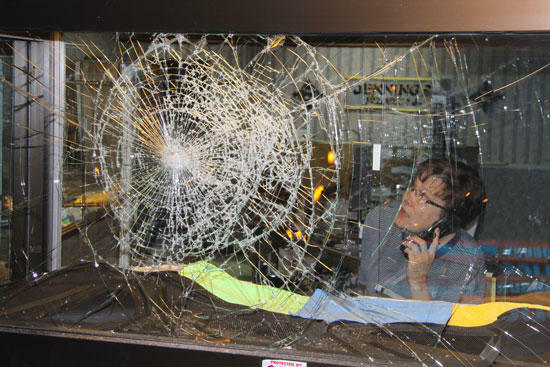 No items were taken as the strength of the glass of the window prevented a complete breakthrough. Store owner Joann Tate arrived shortly after the incident to assist officers in the investigation. No suspect or suspects were identified and no one is known to have observed a vehicle or witnessed the incident. Officers canvassed the area for additional evidence. Anyone with information can report it to the Woodbury Police Department at 563-5940. In incidents which could be connected, Smith Funeral Home on Murfreesboro Road and at least 10 vehicles, including a reported six on Lee Ave., two on Kimela Drive and at least one on Houston Lane, were vandalized early Tuesday morning. A piece of asphalt was reportedly thrown through the front door of the funeral home, breaking a piece of glass at least 110 years old. One witness to the vehicle break-ins on Kimela Drive reported seeing one or two boys wearing hoodies and camouflage pants in the vicinity. Ironically, a brief power outage set off the alarm at the jewelry store at around 6:15 this morning and the one at First National Bank. The outage also knocked out several traffic lights on Main St.
A smash and grab raid or smash and grab attack (or simply a smash and grab) is a particular form of burglary. The distinctive characteristic of a smash and grab, that distinguishes it from other forms of burglary, is its elements of speed and surprise. A smash and grab involves smashing a barrier, usually a display window in a shop or a showcase, grabbing valuables, and then making a quick getaway, without concern for setting off alarms or creating noise. A failed smash and grab raid is indistinguishable from simple vandalism, or malicious damage.